Nikon is a leading sports optics brand around the globe.Its major products essentially used in hunting endeavors range from riflescopes to field scopes and the binoculars. Largely famous for setting new standards in product’s designing and performance. Nikon Prostaff 4-12×40 Black Matte Riflescope (BDC) greatly satisfies my all target shooting needs. Nikon’s unique strength lies in its firm commitment to quality, innovation and excellence in performance. For all these reasons, Nikon is my personal favorite. Packed with remarkable features, Nikon Prostaff (BDC) in jet black matte finish with sturdy body is one of the most demanding rifle scopes among hunters. From dawn to dusk and even on foggy to cloudy days, it delivers maximum light transmission (98%) for precise shooting. You can quickly adjust the turrets with your figure even if you are in the field and target is right in front of you. Features incorporated in any product define its working capacity and excellence. Nikon Prostaff (BDC) comes with below listed remarkable features. The patented BDC reticle is used in this scope allowing target shooters to hit the prey down from longer distance. This is because of BDC’s exclusive see-through ballistic circles. Normal sight picture helps shooting at shorter-range and herein the crosshair itself is considered the aiming point. Ranging from 4 to 12x, the varying magnification of this compact scope helps aiming the targets from shorter to longer distances. It comes with 40mm objective lens for optimal view. The multi-coated optical system embed in this scope enhances the light transmission up to 98 percent of the available light. Many of the similar priced riflescopes lacks this feature. 3.7 inches eye relief is quite generous and offers consistent functionality. It keeps the shooter’s brow safe even if he opts for severe shooting angles. The adjustment graduation of 1/4 MOA gets you zeroed quicker with precise hand-turn. The zero-reset turrets maintain the setting even with the heavy recoiling. Every so often it seems tricky and sometimes a lot difficult to pick the right scope befitting your rifle under your budget. Reason is obvious. Market is overloaded with hunting gadgets of same category. Let me make the job easy for you. 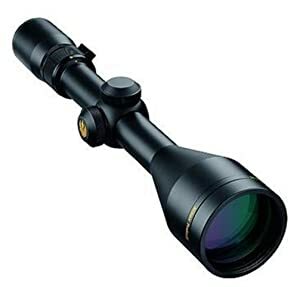 After looking into key specifications, the best way to settle on the best suitable rifle scope is to check if it can fulfill your needs and then delineate whatprivilegesit brings for the users.Following benefits of Nikon Prostaff 4-12×40 Black Matte Riflescope (BDC) makes it a must-have gear in your hunting arsenal. With multi-coated lenses, this rifle scope is durable, cost effective and of good quality. The BDC with see-through ballistic circles awesome and actually makes a big different in target shooting. It provides exceptionally bright sight picture to hunt with ease in the least desirable conditions. It delivers high resolution images for premium shooting even at long distances. Its versatile magnification range brings you the flexibility to hunt in any situation from open prairies to heavy timber or deep forest. It is weather resistant and shockproof because of the incorporated Nitrogen filled and the O-ring seals inside. It works flawlessly with heaviest recoiling cartridges and also the lightweight rifles. From dawn to dusk, you can use it anytime as it boost the light transmission up to 98 percent. The spring-loaded turrets adjustments offers quick zero setting and sustains it for longer even in heavy recoiling. Target acquisition is very much quick and you need not to move your rifle so as to get the correct view. This versatile riflescope is very much cost effective offering optimal features for premium results. It eradicates the need of separate scope for use in different shooting ranges and weather conditions. It zooms with great perfection and focuses with a lot of ease. It comes with adaptable sun shades; 40 mm and 50 mm models. It is a well-built and all-time ready for action kind of rifle scope. Every product has its own positive aspects and certain limitations as well. Well, friends! It all depends on your needs and how you use a product. Overall this rifle scope is a good pick that can have your back in all hunting situations. Nikon Prostaff 4-12×40 Black Matte Riflescope (BDC) can be used with all types of rifles, but best results are achieved when it comes in combination with higher performance rifles. It goes perfect with Browning A-Bolt 223 and Remington 700 SPS Tactical (.223 and .300 Win Mag). Have it on 338 or 308lapua and it will work the best. Clean and well-maintained rifle scope is must for pleasurable and seamless shooting accuracy. What customers are saying on Amazon.com? Hunting needs you to be at safer distance from wildlife and here comes the need of good quality scope for a top notch experience. Nikon Prostaff 4-12×40 Black Matte Riflescope (BDC) is indeed an excellent pick for both the price and hunting applications. It is a perfect choice for avid hunters.It amazingly fits on my 700 mm rem and allows me to get the best performance possible from this rifle. Previous articleHow to Shoot 1000 Yards with No Scope?